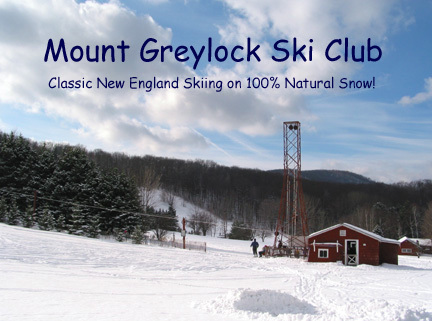 Since 1937 the Mount Greylock Ski Club has operated its own small ski area in South Williamstown, Massachusetts. Nowadays our club offers a very affordable way for families to enjoy uncrowded downhill skiing and telemark skiing on weekends and holidays. Our trails range from easy meadows for beginners to twisty runs through the woods for more accomplished skiers. We always welcome new members. Click here to read about the ski club on Nelsap.org. Please call the Snow Phone (413-445-7887) for the latest information about when we are open for skiing. · Thanks to everyone who has helped out this fall getting the club ready for the season. The place is in great shape and all we need now is some snow! Opening Day is December 22nd provided we have enough snow to open. Please remember that this is a volunteer run club, and we need your help! We can always use people in the mornings to help shovel snow and sand the road. The tows start at 10 on Saturdays and 11 on Sundays, so if you want to help out please come up about an hour early. Thanks for your help, and as always we hope to see you on the hill! At the annual meeting in May the membership voted to pursue some projects to help improve the club. Many of these projects require people to help do the physical work, but all of them require money. With that in mind we have decided to ask for donations to help fund the club's operation and continued success. Please consider donating to your club! Click on the donate button below to help out. You do not need to have a Paypal account. Members, if you have not already done so, please renew your membership as soon as possible.